ProBlog is a professional Blogging theme. Every element of this theme is well crafted and makes your site look like Web 3.0 Blogs. ProBlog theme takes your website to whole new level and you get maximum exposure to the blog posts. 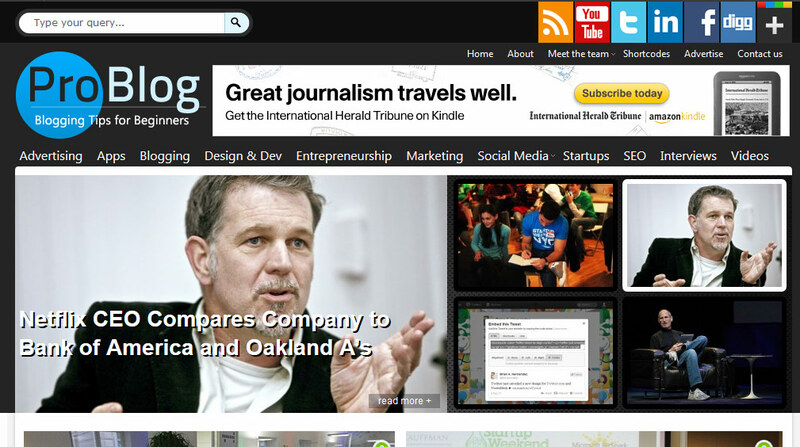 ProBlog theme can be used for Blogging, Tech Journals or General Magazines. Revolutionary Post Formats – With Post Formats, you can control how posts will look on Homepage. You can have thumbnails in left, right, center, a video or the classic blog post format to show on homepage. Easy Drag & Drop Menu – ProBlog is compatible with WordPress 3.0 Navigation feature. Now you can set your own navigation menu by simply dragging items in Menu. Featured SlideShow – Great way to display the BIG news in featured slideshow. You can define from backend that which category will display in this slideshow area. Theme Control Panel – Now add your logo, customize navigations, setup featured categories & ads in just 5 mins. Long story short, You can setup awesome professional Blog or Magazine in few minitues. Advertisment Options – ProBlog has 7 different advertisement placement areas with on/off option, Plus an ad widget for sidebar to add anywhere in sidebar without adding title. Color, Font sizes & Font Family options to change link colors and H1-H6.